Andrew is 37 years old and lives in Devon with his wife and two children. He has been involved in the martial arts for over thirty years and is currently third dan and chief instructor of Mushinkai Karate as well as a student of Kendo. In addition to martial arts, Andrew has worked as a fitness professional and personal trainer for the past eighteen years, and is currently employed by the University of Exeter as Health and Fitness manager. He acts as fitness advisor and trainer to a number of martial arts groups, and is working to improve the knowledge of Anatomy and Physiology amongst martial artists. I first met Andrew at a seminar I taught quite a few years ago in the south of England. Andrew had travelled quite a way to get to the seminar and as luck would have it I would be passing his part of the world on my way back up north. I gave Andrew a lift home and in the couple of hours he was travelling with me we talked at length about the pragmatic application of karate and how knowledge of anatomy and physiology was vital for efficient, effective and safe training. Andrew and I have been in touch since that time. I truly am delighted that Andrew has offered to make this contribution to the guest writer's section. His work is very easy to digest and it is sure to be of great value to all visitors and members. In part 1 of this article on the skeletal system we will take a look at some of the basic component parts that form the structure of the skeleton and its relevance to us as martial artists. In part 2 we will examine the connective tissues and joint movements. If you were to study for a qualification as a fitness professional, you would be taught about the basic functions of the human skeletal system, along with its composition and component parts, early on in the course. 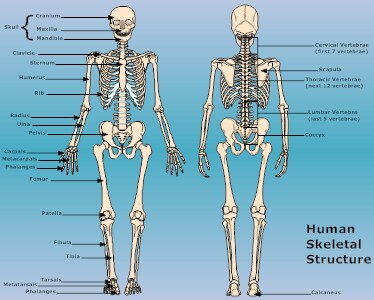 However, as a martial artist we need to grasp a deeper knowledge of the functions and biomechanics of the skeleton. Depending on the discipline you study, your skeleton will be providing you with the unique tools that you need to execute your techniques. Many of us will employ locks as part of our style, so an understanding of the joint types and movements available will allow us to manipulate and exploit this knowledge to our advantage. As instructors, it is also important to have a basic working knowledge of the human skeleton to ensure that we do not employ potentially harmful training exercises especially when working with our younger students. Those studying the grappling arts will be using their skeleton as a comprehensive biomechanical force in order to execute throws and gain leverage for various techniques. Of course, bones can also be utilised to apply force for chokes or strangles and shaped in order to deliver a variety of striking techniques. Interestingly, it is also our bones that defend striking techniques by either employing effective blocking movements, or when all else fails, acting as armour. In Karate do Nyumon, Gichin Funakoshi states: “Practically every part of the body, from the top of ones head o the tips of one's toes, has a potential as some sort of weapon”. This quote clearly illustrates the comprehensive knowledge that has to be understood in order to appreciate the full array of weapons that the body possesses. Students of Kendo, Kenjutsu and other weapon arts will know all too well the speed and force that can be produced when extending our biomechanical levers with a weapon. Swords are often viewed as an extension of the body and they are literally just that. General knowledge of the anatomy of the skeleton would have been a compulsory module of any Samurai's training. This would have allowed sword strikes to be performed at the correct angle, thus avoiding the protective armour of the skeleton and making for a more efficient and faster kill. Sadly, as today's martial arts are mainly taught as “sports” or “leisure” activities, these qualities do not form part of the curriculum. However, general knowledge of the body and its functions may help the student lead a healthier life and act as a “role model” to others. Most of us will be familiar with the tough or compact outer surface of the bone through our training. If we follow a striking art, we will have undoubtedly spent countless hours punching a bag or makiwara. Judoka will have spent “hands on” time working with opponents through Randori in order to learn the movements of the body and its weaknesses. Few of us will have given much thought to the internal structure of the bone and the vital functions that it performs. As previously mentioned, blood cells are produced within the bone and yellow fat marrow can also be found within the bone. 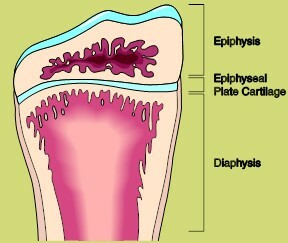 The compact outer layers of the bone cover a cancellous or spongy latticework. Contrary to many martial artists' beliefs, bone is therefore living tissue and should be treated with care. Whilst it is true that the exterior of the bone can be strengthened through weight bearing or impact exercise, excessive “toughening” exercises can cause serious damage to the bone structure, resulting in deformity or disease of the bone itself. Instructors should pay particular attention to this when instructing younger students. The human skeleton starts out as mainly cartilage and develops into calcified tissue through a process known as ossification. Within the gym or sporting environment, special attention should be paid to younger persons engaging in “resistance” type training, to ensure that the developing skeleton is not adversely stressed through the activity being performed. In fact, it is widely accepted that parts of the human skeleton may not stop growing until around the age of 25.